I’ll be going on about Wikidata, images, and tools. Again. You have been warned. I have written a few image-related Wikimedia tools over the years (such as FIST, WD-FIST, to name two big ones), because I believe that images in articles and Wikidata items are important, beyond their adorning effect. But despite everyone’s efforts, images on Wikidata (the Wikimedia site with the most images) are still few and far between. 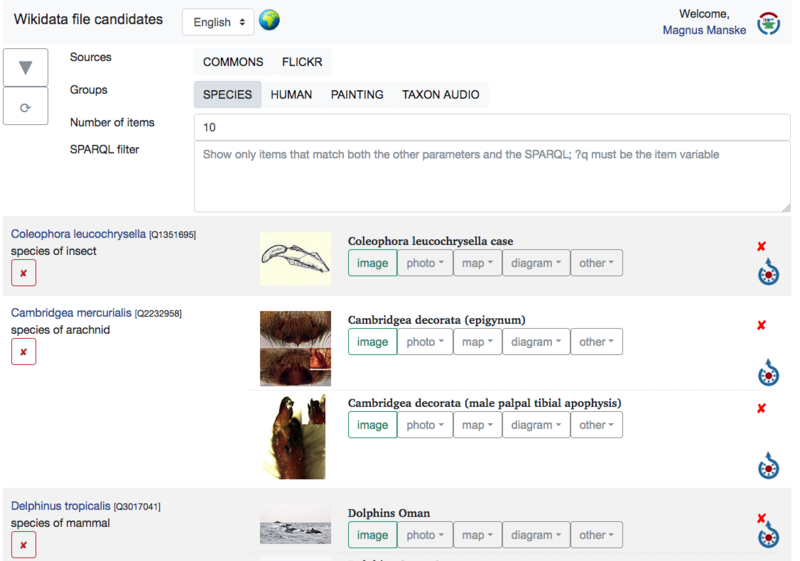 For example, less than 8% of taxa have an image; across all of Wikidata, it’s rather around 5% of items. On the other hand, Commons now has ~45M files, and other sites like Flickr also have vast amounts of freely licensed files. So how to bring the two of them together? 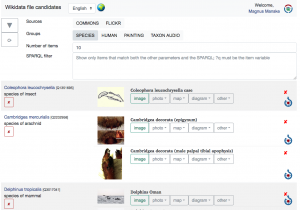 One problem is that, lacking prior knowledge, matching an item to an image means full-text searching the image site, which even these days takes time for thousands of items (in addition to potential duplication of searches, stressing APIs unnecessarily). A current example for “have items, need images” is the Craig Newmark Pigeon Challenge by the WMF. There is another aspect of this tool I am excited about: Miriam is looking into ranking images by quality through machine learning, and has given me a set of people-file-matches, which I have already incorporated into my “person” set, including the ranking. From the images that users add through this tool, we can then see how much the ranking algorithm agrees with the human decision. This can set us on a path towards AI-assisted editing! ADDENDUM: Video with demo usage! This was written by Magnus. Posted on Tuesday, February 6, 2018, at 18:12. Filed under Commons, Wikidata, Wikimedia. Bookmark the permalink. Follow comments here with the RSS feed. Both comments and trackbacks are currently closed.